My Mother-in-law served this as side dish for meats,with picnic lunch with salad,or served cold the next day. Potato Pie always reminds me of how happy she was just to be cooking for her large family. 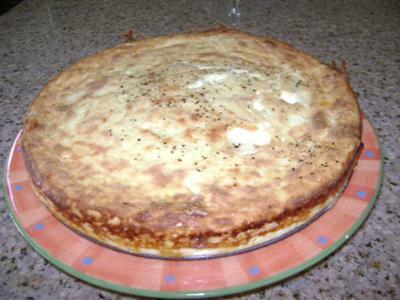 In large bowl mix mashed potatoes, ricotta,slightly beaten eggs. Place in 10 inch spring form pan that you grease and flour. Place all ingredients in pan, sprinkle grated Parmesan and pepper on top. Place in oven on a cookie sheet. Bake 1 1/2 hours. Let stand 2 hours. Cut as pie. All of my favorite things are in this pie! Potatoes, cheese, bacon--yummy! Looks like a really good recipe. Used my leftover potatoes, tasty!